Recently I had some serious problems with wi-fi at home - especially one of the laptops was dropping off and couldn't come back. Quick survey using Kismet and other tools to scan what's flying around has proven that my network is in less populated part of the spectrum (at least here) but still, problems are getting worse and worse. I was fully aware of Wi-Spy by Metageek, seen it in action previously but never had a chance to buy one. Part of the decision was the price back then, maybe now it would be another game, but anyway - I got myself another device, made by well known wi-fi vendor Ubiquiti and it's called AirView2. What's so special about this one? Why it's better than Wi-Spy? First of all I didn't say it's better. It's different, woks with Linux, Mac OS X and Windows, has a nice price tag and does pretty much the same as Wi-Spy. Let's have a closer look then, shall we? Well, obviously it is... it comes from different vendor... and this post is not a sales pitch - it's just what I've experienced myself. On a bit more serious note, it's smaller than all the Wi-Spy models I've seen so far. Smaller is good, right? Yes - takes up less space, No - easier to loose (looks almost like USB stick). Yes, it does... better or worse but it does and it's not a matter of hardware or bundled software, but clearly it depends on the host OS and Java. You got it right - Java! Software is written in Java to be really cross platform, but those that are not Java developers but use it a bit know quite well what a pain in the rear Java can be. Same is here - Ubiquiti warns about compatibility issues, there are long posts on the forums why this particular version of AirView software doesn't work (mostly on Mac OS X) and how to fix it, etc. Windows - OK, even inside VM with USB passed through to the guest VM (tested VirtualBox, VMWare Workstation and Fusion - all with Windows 7 and latest Java). It was all very slow, loosing connection with the device and re-initializing it all the time, but worked. In native mode with Windows 7 on bare metal box worked like a charm (tested on a netbook PC). Linux - didn't try, not enough time - sorry. Mac OS X - yeah... that sucked! If you have the latest patches installed most likely the software will hang on detecting the device. Of course the reason is Java + OS X (I'm on 10.6.2 as of now with Java 1.6.0_17 in 64-bit mode). This argument is obviously quite important. Is it that much cheaper? I'm not so sure... of course you can get the basic Wi-Spy for about Â£65+VAT so even if AirView2 would be equal to it in hardware terms, it would cost a bit more - Â£69+VAT... There is one catch to it though - AirView2 comes in several versions. I bought the AirView2-EXT for Â£64+VAT and this one has MMCX connector for external antenna (because it doesn't have a built-in one) and with clip-on omnidirectional antenna (~3-5dBi I guess) in the package. To buy Wi-Spy with RP-SMA connector you would have to spend at least Â£120+VAT which is almost double the price of AirView2-EXT. HINT: Wi-Spy with RP-SMA is 2nd generation - faster with better scan resolution than the first generation of the device. So far I didn't have enough time to grab the full spec for AirView2 and compare them side by side - that would be very interesting (it's already on my TODO list). Does it do the same stuff? I would say YES based on what I can see, but as most of those devices are SDRs (Software Defined Radio), they can do all the software allows them to do and I didn't have a chance to compare recent version of Wi-Spy software to the AirView one, so please take my words here with a grain of salt and look for other sources to confirm that. The device worked for me like a charm - it turned out that the signal from my AP was attenuated by temporary objects that came in the way (books - whole piles of them) and as the amount of networks around at least doubled in the last 12 months, somebody put up some very messy device that is transmitting all the time with a very wide signal, exactly in the area of channel I was on - so here come the interference! Quick look at the graphs and it was clear, that simple channel change should cut down on the interference and moving books a bit will improve signal strength in a place where this unlucky laptop is used most of the time - it worked very well, no more problems! Looking at the bottom line, for me that's a money very well spent! I was asking myself a question 'how often I will use this thing' and now I really appreciate the power of seeing something that Kismet and similar tools won't see. 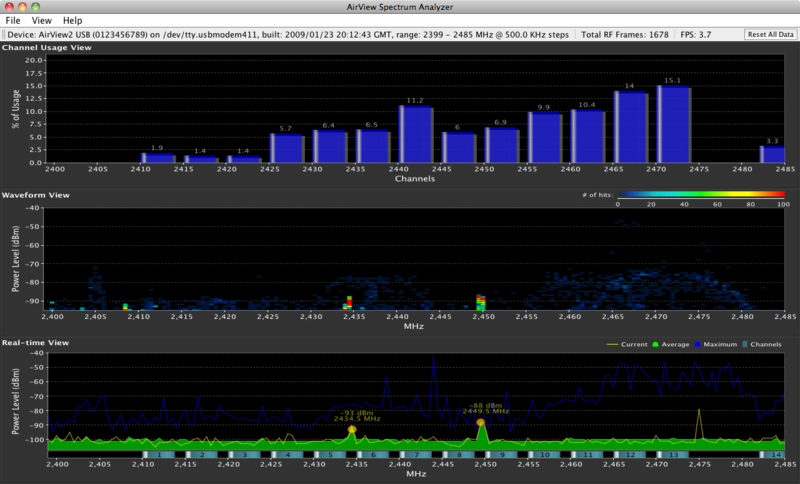 Using spectrum analyzer like AirView or Wi-Spy (doesn't really matter which one - pick one that suits your needs) is like reading between the lines - there is a lot of valuable information out there... if only you can see it!